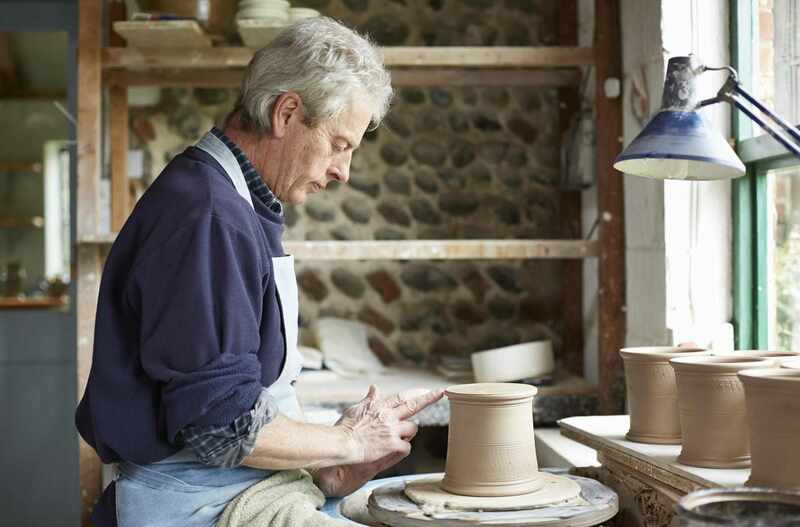 Pottery can be a mild interest, consuming little of your time or money, or it can become a major part of your life. If you are just starting out, it is a good idea to try pottery out or take a beginner's class. If you are starting out on your own, here are some tips on how to begin. Clay is fascinating and it will lend itself to your skill level, whatever it may be. Pinch pots are easily accessible to nearly everyone, including young children. You can easily learn to make a pinch pot in less than an hour. Clay is never boring; there is always more to explore, more to try out and more to create. Be prepared for a fine adventure as you enter the world of pottery, for clay is as deep and as broad as the earth it comes from. A cabinet or other storage area for glazes, where pets and children cannot get to them. Another option is to defer finding a space of your own while trying pottery out. The easiest way to do this is to take a beginning pottery class. There are a lot of variables in clays and glazes. The most important variable is what temperature the clay matures at. Glazes have to be matched to the clay according to its maturation temperature. Many clays and glazes are rated by "cone". This is a way to measure heat work (similar to temperature). Zeros are important! Find a local potter who will rent you kiln space. Find out what temperature(s) they usually fire to, and what atmosphere (oxidation, neutral, or reduction) they fire in. Get clay and glazes that mature in that firing range and are best in that atmosphere. Ready-to-use clay and glazes are fairly readily available. These come in a variety of colors and temperature ranges. Check with your local pottery or ceramic supplies store, artist supplies store, or art supply retailer. Local stores may be able to help you, or you can check out online retailers. As you use larger quantities, you may want to order clay, glazes, and other supplies in larger quantities. Ordering larger amounts can save you money in overall shipping costs, especially when you do not have a local ceramic supply company near you. When your clay is too wet to easily work, plaster bats are very useful. The plaster soaks up excess water from the clay as you wedge the clay on the bat. To make one take a shallow box, like a clean pizza box, mix your plaster according to the directions, and pour it into the box. Once set and cured, you will have a plaster bat. Dry greenware is ready to fire when it is bone dry (no longer cool to the touch). For this, you need a kiln. For someone just getting started, a kiln is often too expensive to buy. Ask local potters if they rent kiln space. Remember that they are working on their own pottery and have their own schedules. You may have to wait until they have a kiln-load that has space for your pots. If you are interested in the firing process, don't be shy to ask if you can help. There is nothing like experience to understand everything involved in firing a kiln. The potter may really appreciate the help with loading and unloading kilns and tending them as they fire. Clay shrinks as it dries, some more than others. Pots also shrink when they are fired, especially when fired to their mature temperature. In both cases, the shrinkage is due to the fiber of the clay becoming tighter. In the first case, this is through the removal of water molecules. In the second case, the tightening is caused by the melting that occurs on the molecular level. If you need a pot to be a certain size when it is finished, you may want to make a shrinkage ruler to help you know what size it must be when it is wet.